erik jorgensen verpan carl hansen vitra kartell bensen herman miller knoll flos artek artifort foscarini moooi and more! WALL TILES NOA MINNESOTA ASH FLOOR TILES SEEDWOOD MINNESOTA ASH VANITY IN ALABASTRO BRILLO With its high quality and beauty, Seedwood is a wood-look porcelain tile collection that evokes the true elements of natural hardwood. Seedwood is available in 11 different shades and has 4 complementary accent tiles. Visit your local Porcelanosa showroom for more information. Free spirited and audacious designer Kenzo Takada, known as "the most Parisian of Japanese fashion designers", has designed an exceptional collection of fabrics and ceramics for Roche Bobois. To dress the Mah Jong sofa, he drew inspiration from traditional kimonos of the NĂ´ theater. He reinterpreted the motifs and colors, creating delicate and sophisticated harmonies that symbolize the three times of the day: Asa (morning), Hiru (noon), and Yoru (evening). Photo: Michel Gibert, image for advertising purposes only. Special thanks: Stone Sculpture museum of the Foundation Kubach-Wilmsen. Mah Jong. Modular sofa system, design Hans Hopfer. Upholstered in NĂ´ Gaku fabric, Yoru version, designed by Kenzo Takada for Roche Bobois. Manufactured in Europe. Highlights from IDS Vancouver 2017; the winner of GRAY’s Pitch Tank contest; and celebrating award winners region-wide. Designer of the 2017 GRAY Award, glass artist John Hogan pushes the medium into thrilling new directions. The BLOCK Project, an innovative approach to tackling homelessness. EDITORS’ PICKS 40. Tour a selection of our favorite projects, spaces, and pieces from GRAY Awards submissions. In a barren landscape, a masterfully designed high-performance building rises, manifesting its connection to the land both literally and lyrically. Glowing like a green lantern at night, an angular, unconventional home and studio makes the most of its compact site. After years of Congressional debate, this landscape is the last site to be developed on the National Mall. An aptly named restaurant nods to the German modernist movement. Raw-silk walls and a gallery-worthy collection of artistic lighting tipped this project into the judges’ favorite. A socially conscious designer weaves the spirit of human connection into her latest luxe apparel collection. A mind-bending new way to think about concrete. An emerging design studio grabs our attention by reimagining a most utilitarian tool. A renowned architecture firm plays a true wild card by exploring a new medium . . . that melts. A dozen students work together to imagine a sustainable solution to modern housing. Turning a design brief on its head, a Northwest firm and a troop of students transform a temporary festival stage into a tiny house community for the unhoused. GRAYâ&#x20AC;&#x2122;s first annual, multidisciplinary design awards program recognizes the best work across the Pacific Northwest. Out of 363 stellar submissions, see who made it to the final round. B E S T. D E C I S I O N . E V E R . When it comes to your dream home – making sure it is perfect means tons of tough decisions. Let our knowledgeable product experts relieve the stress and restore the fun while introducing you and your design team to our extensive collection of products from the most sought after brands. and the winners of the inaugural GRAY Awards design competition—was unveiled at the first GRAY Awards party, held November 29 at the Sanctuary at the Mark, a newly renovated historic church–turned– grand ballroom in downtown Seattle designed in collaboration with Philippe Starck (his first project in the Pacific Northwest). Here we celebrate not just the winners but the entire Pacific Northwest design community. The winning projects were announced amid a glittering explosion of confetti as the judges personally lauded each exceptional project and the University of Washington marching band burst into the room and onto the stage stage to mark the grand reveal of this issue. Accompanied by their signature song, “Tequila,” we passed out a round of shots, and everyone pretended it wasn’t the middle of the week and we wouldn’t regret the inevitable hangover come morning. When we launched the awards program earlier this year, inviting regional design talent to throw their hats into the ring, we knew the competition would be tough—and it was. This issue gives you an up-close look at the incredible work that surfaced, all marked by the quality, ingenuity, and sheer beauty characteristic of the Pacific Northwest itself. We begin with 16 favorite projects earmarked by our editors and then move on to showcase the winning entries selected by our all-star panel of judges: Deborah Berke, Roman Alonso and Steven Johanknecht of Commune, James Corner, Olivia Kim, Ingo Maurer, Karim Rashid, Philippe Starck, and Vicente Wolf. No. 37 Copyright ©2017. Published bimonthly (DEC, FEB, APR, JUNE, AUG, OCT) by GRAY Media, LLC. All rights reserved. Permission to reprint or quote excerpts granted by written request only. While every attempt has been made, GRAY cannot guarantee the legality, completeness, or accuracy of the information presented and accepts no warranty or responsibility for such. GRAY is not responsible for loss, damage, or other injury to unsolicited manuscripts, photography, art, or any other unsolicited material. Unsolicited material will not be returned unless accompanied by a self-addressed stamped envelope. If submitting material, do not send originals unless specifically requested to do so by GRAY in writing. POSTMASTER: Send address changes to GRAY, 5628 Airport Way S., Ste. 330 Seattle, WA 98108 Subscriptions $30 US for one year; $50 US for two years. The following architecture and design firms are among the best in the region. 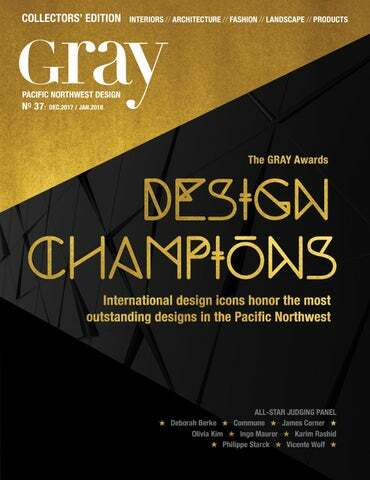 They also support GRAY’s effort to advance the Pacific Northwest’s vibrant design community. We’re proud to call them our partners. Look to them first for your next project. Visit their portfolios at graymag.com or link directly to their sites to learn more. PACIFIC NORTHWEST INTERIOR DESIGN The following design firms are among the best in the region. They also support GRAY’s effort to advance the Pacific Northwest’s vibrant design community. We’re proud to call them our partners. Look to them first for your next project. Visit their portfolios at graymag.com or link directly to their sites to learn more. © 2017 Design Within Reach, Inc.
interior designer Alexa Hampton and Michelle Newbery of The Mine; keynote speakers Glenn Lawson and Grant Fenning of Lawson Fenning. For this year’s GRAY Stage, Jessica MacDonald and Kate Snyder of Vancouver’s burgeoning Studio Roslyn delivered a design evocative of Art Deco–inflected Hollywood glamour, combined with their reinterpretation of the authentic theatrical stage. “We were interested in exaggerating some [vintage] elements and juxtaposing them with contemporary details like sleek furniture and sheer, oversized balloons,”says Snyder. British Columbia Timberframe Co. brought the designers’ vision into reality, and, after the show, Habitat for Humanity of Greater Vancouver collected the stage materials for reuse. Â© 2017 Design Within Reach, Inc.
Vancouver-based interior designer Karin Bohn interviews Italian sculptor and industrial designer Matteo Cibic at the GRAY Stage. Each year at IDS Vancouver, GRAY editors walk the floor before opening night and pick the exhibitor booths they feel show the most innovative and eye-catching design. This year’s winners include FRAME Magazine, whose modular design was created from paper by Molo; Lock & Mortice, with a simple yet elegant take on a house frame; the Furniture Society’s handmade seating; and Different Designs Group’s feminine addition to the Studio North section. Seattle artist Julie Conway of Illuminata Glass fabricated this year’s award—a piece that reflects the region’s industrial roots. impact! Get ready to discover fresh design solutions, expand your network, and fine-tune your expertise. Kick off 2018 at the ultimate destination for everything kitchen and bath. Register now at kbis.com. Though the AVA Byte unit is small—essentially a sleek, high-tech 18-inch-long planter box—the high-tech concept could have a sizeable global environmental impact. â&#x20AC;&#x153;I am and always have been inspired by color.â&#x20AC;? See the GRAY Awards trophy on pg 162. OPPOSITE FROM LEFT: Hogan in the hot shop; Untitled, 2017. THIS PAGE: Vita, 2016. IT’S RARE FOR AN ARCHITECTURE FIRM TO LEAD WITH ANYTHING OTHER THAN DESIGN, BUT FOR SEATTLE’S BLOCK ARCHITECTS, IT’S EMPATHY THAT POWERS PROJECTS. Founded by Rex Hohlbein and his daughter Jennifer LaFreniere in May 2017, BLOCK Architects, a firm aiming to fight homelessness through community building, is the result of several years of discussion about linking architecture and homelessness. Although it’s not Hohlbein’s first foray into the social justice sphere (he closed his high-end residential architecture firm in 2014 to focus on Facing Homelessness, his nonprofit organization that seeks to debunk adverse stereotypes of people living on the streets), BLOCK Project, the firm’s first endeavor, is the most ambitious to date. “Two of the biggest stumbling blocks to housing are a perceived lack of land and limited dollars,” he says, “but we think that being cut off from the community is a deterrent to people looking to improve their lives. BLOCK Project tackles these issues simultaneously.” The concept is simple: recruit homeowners who are willing to host a 125square-foot tiny house (and a formerly homeless tenant) on their property. The structures are fully self-sufficient, featuring solar panels, a graywater system, and a composting toilet, and they incorporate a kitchen, a bathroom, a sleeping area, and storage. The hosts and tenants go through a rigorous matching process to ensure that the placement is based on a friendship rather than a transaction. “We want to encourage interaction between the two,” LaFreniere explains, noting that the foremost goal of BLOCK Project is building community. “It’s not about putting down this house and then having everyone go their own way. Building relationships is a crucial first step in folding these people back into the community.” All BLOCK host families receive a monthly stipend; however, all hosts thus far have opted to waive the stipend, choosing to donate the funds back to the project. BLOCK Architects founders Rex Hohlbein and Jennifer LaFreniere, his daughter, in front of the first tiny house built through their nonprofit organization BLOCK Project. 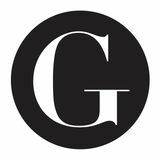 THE GRAY EDITORS SHARE SOME FAVORITE DISCOVERIES FROM AMONG THE 363 GRAY AWARDS CONTENDERS. BLANCO IKON® - the first apron front of its kind with the beauty, strength and durability of our SILGRANIT® sink material. The unique architecture and natural beauty create a focal point allowing the sink to become the true heart of the kitchen. ÂŠ2017 California Closet Company, Inc. All rights reserved. Franchises independently owned and operated. Experience a California Closets system custom designed specifically for you and the way you live. Visit us online today to arrange for a complimentary in-home design consultation. BATHROOM ACCESSORIES | DECORATIVE GRAB BARS | FREE STANDING TOWEL WARMERS | SHOWER DOOR HANDLES VISIT KARTNERS.COM TO FIND ONE OF OUR FINE DEALERS NEAR YOU! AN INSPIRED DESIGN DESERVES CUSTOM DETAILS. “These days aren’t meant for isolation,” says designer Suk Chai, winner of the GRAY Award in fashion. “On the one hand, we’ve never been better at solitude—how easily we fold into our artificial shells and seal ourselves inside. But as it gets easier to do without human connection, we’re faced with the simple, enduring truth that, all alone, we feel less. We create less. We are less.” As an antidote to disconnection, Chai’s fall–winter 2016–17 collection, titled Legion, is an homage to the spirit of togetherness and team effort. With simple shapes, rich colors, subtle military influences, and sumptuous cashmeres, crepe, and twill fabrics, Chai imagines an army of “humble visionaries,” all holding tightly to the same towline, pulling for and with one another, as her design inspiration. The glass-and-molded-plastic Sir Gio table, designed for Kartell. OPPOSITE FROM LEFT: Paris-based designer and architect Philippe Starck; the WOW sofa, designed for Driade. 21c Museum Hotel, Louisville. OPPOSITE FROM LEFT: Deborah Berke, architect and dean of the Yale School of Architecture; 21c Museum Hotel, Oklahoma City. A residence in Paris; designers Roman Alonso and Steven Johanknecht, founders of Commune. Ceremony’s influential vice president of creative. In 2012, Kim met Pete Nordstrom, Nordstrom’s president of merchandising, through a mutual industry contact, and the two discussed how the 116-year-old Seattle retailer could create engaging in-store experiences for its customers. Kim made an impression: six months later she accepted a job as Nordstrom’s director of Creative Projects, a newly created role. Now the brand’s vice president of Creative Projects, Kim can often be spotted running among ready-to-wear presentations in global fashion capitals such as Paris and Milan, wearing her signature sneakers or Doc Martens. Spring 2017’s Pop-In@Nordstrom, KFASHION, spotlighted pieces by Korean designers KYE, Hyein Seo, and J KOO. OPPOSITE FROM LEFT: Nordstrom vice president of Creative Projects, Olivia Kim; the downtown Seattle Nordstrom flagship features an Hermès accessory-only boutique, the first of its kind. WALK INTO ONE OF INGO MAURER’S LIGHTING SHOWROOMS AND YOU’LL GET A VISCERAL, VISUAL PEEK INTO THE MASTER LIGHTING DESIGNER’S WILDLY CREATIVE MIND—AND THE FRESH THINKING THAT DREW US TO HIM AS A GRAY AWARDS JUDGE. A spiky chandelier made from jagged porcelain shards lurks in a corner; a bare bulb encircled by what appear to be fluttering butterflies dangles from the ceiling. A desk lamp, in Maurer’s fertile imagination, might become a comics-inspired speech bubble wired with LEDs and seemingly leaping off a metal base plate, or a frosted bulb outfitted with a tiny pair of goose wings as if caught in mid-flight. The iconic Zettel’z 5 chandelier comes with printed and blank sheets of paper, allowing users to express their own creativity. OPPOSITE FROM LEFT: The delightfully unpredictable lighting designer Ingo Maurer; red ceiling panels striped with LEDs boldly identify Munich’s Marienplatz subway station, a collaboration with Allmann Sattler Wappner Architects. The “blobular” Lava bench, designed for Spanish furniture company Vondom. OPPOSITE FROM LEFT: New York–based multidisciplinary designer and artist Karim Rashid; his selfdesigned office in Shenzhen, China, features custom-made digital-printed wall coverings and materials ranging from poured resin to stretched fabric to fiberglass. A luxe bedroom in Scarsdale, New York. OPPOSITE FROM LEFT: Interior designer Vicente Wolf; a bedroom designed by Wolf in Sag Harbor, New York. The Shade Store Fran’s Chocolates Considered one of the best chocolatiers in the U.S., Fran’s Chocolates offers elegant presentations of award-winning chocolates for every occasion. Each confection is handmade in small batches with the finest local and organic ingredients to reflect a passion for exquisite flavors and the pure taste of chocolate. Visit us online or at one of our four Seattle-area retail stores: Downtown, Georgetown, University Village, and Bellevue. Urban Interiors & Thomasville At Urban Interiors & Thomasville, Tommy Bahama offers designs across a diverse range of styles— choose from 175 all-weather performance fabrics with the same soft hand, rich colors and vibrant patterns as our indoor upholstery, complete with trims, fringes and designer options. Every item is hand crafted and features artisan finishes. Alchemy Collections Located in downtown Seattle, Alchemy Collections is your Western Washington source for modern and contemporary furniture. Sensing a void in the Seattle furniture landscape, Alchemy Collections opened in 2004, bringing a modern yet accessible furniture venue to the everyday Seattleite. Traditional Techniques + Modern Design Specializing in authentic vintage Moroccan rugs. Each is carefully sourced and chosen for its expressive modern style and cultural significance. Look into the heart of Lapchi and you’ll find a rug maker with a wealth of experience in custom rugs. Lapchi produces handmade rugs in custom colors and sizes at no additional cost. Make your next rug a custom rug by Lapchi. Congratulations to the winners of the 2017 GRAY Awards. For more about the award designer, see pg 36.